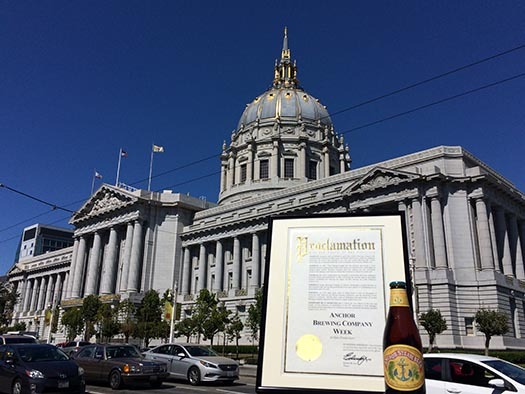 August 2015 marks an important milestone for Anchor Brewing Company. Fifty years ago Fritz Maytag acquired and revived our San Francisco brewery, igniting a movement that would lead to today’s American Craft Brewing Revolution. 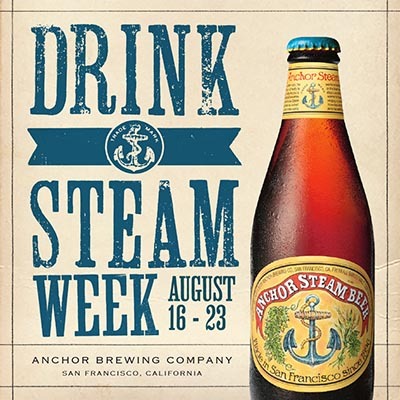 In honor of this historic event, the Mayor’s office for the city and county of San Francisco has officially proclaimed August 16-23, 2015 as Anchor Brewing Company Week (or as we like to call it, “Drink Steam Week”). To commemorate this milestone and proclamation, we’ve created a variety of events taking place throughout San Francisco to ensure that Anchor fans will have the opportunity to toast to America’s First Craft Beer – Anchor Steam. Stop by our beer garden, The Yard, for Anchor Steam pint deals and giveaways. Visit any Humphry Slocombe location for a scoop of their limited-time flavor, “Anchor Steam Cream”. Purchase a limited-edition Drink Steam shirt from any San Franpsycho location, featuring a custom design drawn by local artist John Keegan. While you’re there, enter to win a VIP brewery tour and tasting! Post a photo of you Drinking Steam and share it with the #DrinkSteamWeek hashtag. August 16th: Drink Steam at Stern Grove Festival! Grab a 6-pack of Anchor Steam and head out to the free concert featuring Talib Kweli. August 20th: Drink Steam with local maker and artist Ricky Watts as he brings his art to life before your eyes in an intimate live-painting session. August 21st: Get a free scoop of Humphry Slocombe’s “Anchor Steam Cream” with a pint of Steam Beer at The Yard, or combine them and turn it into a float! August 22nd: Drink Steam Silent Disco bar crawl in North Beach produced by HUSHconcerts. Check out www.drinksteam.com for more details about Drink Steam Week. We hope you’ll join the celebration and Drink Steam!